D’Ambrosia, Clyde, Fricke, Gringerich, Abels, 2017, Repetitive mammalian dwarfing during ancient greenhouse warming events: Science Advances, v. 3, e1601430. Rapid global warming in Earth’s past had occurred more than once. The most commonly studied episode occurred 55 million years ago, at the boundary between the Paleocene and Eocene epochs (Paleocene Eocene Thermal Maximum, PETM). Several other episodes have happened, including the ETM2 and H2 episodes which are discussed in this paper. Thomas and Shackleton, 1996, The Paleocene-Eocene benthic forminiferal extinction and stable isotope anomalies, in Knox, Corfield, Dunay, eds., Correlation of the Early Paleogene in Northwest Europe: Geological Society Special Publication n. 101, p. 401-441. This paper examines the abundance and geochemistry of single-celled organisms called foraminiferans (forams) that were living in the oceans around 55 million years ago. Forams are still present today worldwide. They make little tiny calcite skeletons (called tests) that can be used to identify the species and then can be analyzed. Schmitz and Andreasson, 2001, Air humidity and lake δ18O during the latest Paleocene-earliest Eocene in France from recent and fossil fresh-water and marine gastropod δ18O, δ13C, and 87Sr/86Sr: Geological Society of America Bulletin, v. 113, p. 774-789. What Can A Clam Teach Us About Climate Change? One of the many projects I work on involves the study of climate change in the fossil record. I’ve put a bit of it on-line here. What I’ve published thus far deals mostly with interpreting general climatic and environmental factors using bulk geochemistry (all isotopes) from rocks and the fossil contained therein. That is to say, I take a big rock or fossil and grind it (or part of it) down into a single sample. I analyze that and call that a ‘average’ for that entire rock layer. The Paleocene-Eocene Thermal Maximum – Is Modern Global Warming Anything to Worry About? There are lots of names for it, some good, some bad: Climate Change, Global Warming, Climate-gate, The Climate Hoax. Unless you’ve had your head in the sand, you’ve heard at least one of these things. You know that there is a lot of talk about how every year seems to be warmer than the last – “the warmest on record” – and that there have been a lot of wacky weather phenomena of late, including Hurricane Sandy, heat waves in Australia and Europe, massive wildfires in the western United States. Some reports are pretty alarmist, while others claim that these are merely coincident anomalies that we only know of due to more complete modern measuring techniques and records. Some say that the Earth is warming at an alarming rate and we need to prepare for a “The Day After Tomorrow” type scenario, while others say that we have no need to worry and that it’s all hype. And really, how bad can one or two degrees of temperature increase be? If you’ve read other posts of mine, you probably know where I stand on this. For this post, my views on the legitimacy of modern global warming are irrelevant. What I want to address here is not whether warming is occurring, but what would happen if those noisy scientists are right and we are heading toward a warmer Earth? What could the possible outcomes of a few degrees of warming be? There are models, of course, all mathematical and computerized, that show where things will get wetter or drier and such, but let’s think about something more real. What if the hype is correct and we are warming? What will happen if we do nothing to mitigate it? The fossil record provides an opportunity to look at past climate changes and see what effects these changes had on the animals that were alive during that time. The fossil record shows that there have been multiple episodes of global warmth in Earth’s history, much warmer than is projected as a possible outcome of today’s warming. But being warm and warming rapidly are two different things. Gradual warming occurs slowly enough that organisms can adapt. But modern warming is occurring within a single to just a few generations of animals, much too quickly for adaptation to occur. What happens then? Does the fossil record capture any past episodes of rapid global warming? If so, what happened? The short answer is ‘yes,’ and it was bad news for many animal groups. The specific example I will use is the Paleocene-Eocene Thermal Maximum (PETM). This is an episode of global warming that occurred about 55 million years ago (about 10 million years after the dinosaurs went extinct). The entire PETM lasted 150,000 to 200,000 years, with the warming occurring over the span of about 10,000 years. Depending on what you read, the warming was between 5-9° Celsius (9-16° F). Compare that with modern projections of warming of 4° Celsius (or more) in a few hundred years. Warming rates are much faster today than they were at the PETM, and rates at the PETM were much, much faster than most other rates of climate change recorded in the rock record. The chart above shows a lot of things. It was published in 2003 in Geological Society of America Special Paper 369. It is available here, from Philip Gingerich’s personal web page focusing on his research on the PETM. I suggest reading the entire paper to get the full context, but for the sake of this post focus only on the columns on the right hand side. There are two columns labeled ‘stable isotopes,’ and a series columns (some highlighted in green and others in red) that represent the stratigraphic ranges of specific vertebrate groups. 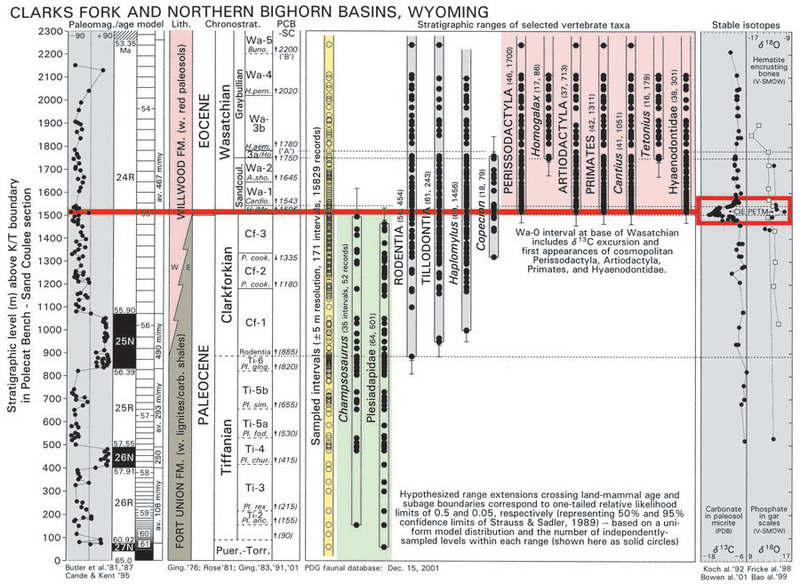 The heavy red line marks the Paleocene-Eocene boundary, and the box in the stable isotope column encloses the isotopic evidence of the PETM – a negative spike in carbon isotopes and a positive spike in oxygen isotopes. It is the positive spike in oxygen that provides the evidence of warming. The negative spike in carbon provides information about the source of the warming (carbon dioxide in the atmosphere). The details of how the isotopes provide such information is a topic for a different blog post. Focus now on the highlighted vertebrate groups. In green are the Plesiadapidae. Plesaidapids are a group of mammals thought be closely related to modern primates. They go extinct at the Paleocene-Eocene boundary. Modern primates, highlighted in red, appear after the Paleocene-Eocene boundary. It’s possible, then, the the PETM, was responsible for the extinction of the the plesiadapids and appearance of modern primates. Perhaps one evolved into the other, we are not sure at this point, but the loss of one and appearance of the other coincides with the PETM. You also see, highlighted in red, the first appearance of the groups Perissodactyla and Artiodactyla. These are all the modern hoofed mammals. (Perissodactyla includes horses, rhinos, and tapirs. Everything else is in the Artiodactyla.) It is the appearance of the first perissodactyl, Sifrippus (also called Hyracotherium or Eohippus) that defines the beginning of the Wasatchian North American Land Mammal “age” which is thought to be coincident with the Paleocene-Eocene boundary. Prior to the PETM, there were no true hoofed mammals, though it’s though that the ancestors to perissodactyls and artiodactyls could be found in a group of mammals loosely called the condylarths. Condylarths dwindled after the PETM, to be replaced by the recognizable, modern groups of mammals. Thus it’s possible that rapid global warming at the Paleocene-Eocene boundary resulted in the rapid evolution of mammalian species, resulting in the loss of many groups that had previously been dominant, and their replacement with new groups. This is a big change. This is not an example of just a few species going extinct. We’re talking about entire orders of mammals here, including the Order Primates, of which we are a member. Now consider again that warming at the PETM took place over several thousands of years. Modern global warming is occurring over several hundreds of years. If warming at the PETM forever altered mammalian history, what would modern global warming do? Perhaps we should think about this before we say that there’s no need to be concerned. This post has been translated into Spanish by Jorge Moreno-Bernal, a student at the University of Nebraska-Lincoln. See the translation here. How cool is that? I was recently interviewed by Gary Vecchiarelli for a lovely website called Jersey Boys Hunt Dinosaurs. He was particularly interested in my take on the science of paleontology from the perspective of a geoscientist. It was a fun little interview, and might be of interest to any budding paleontologists or folks just interested in what my scientific world is like. Read the interview here. You should visit the Jersey Boys Hunt Dinosaurs website and/or follow them on Twitter. Thanks Gary! That was fun! What Does the Fossil Record Say About How Speciation Happens? Below are the answers to a series of questions asked of me by a friend from way back in high school. His questions were interesting enough, that I thought I’d post the answers here. Other folks might be interested, too. These answers come off the top of my head. I did not research them, so I might have a few details wrong. But the overall story should be about right. This is the first installment of my attempt to convert a scientific paper (my own) into plain language that is accessible to everyone. Feel free to ask questions in the comments. I’ll respond there, or with additional blog posts. Climate change at the Paleocene-Eocene boundary: New insights from mollusks and organic carbon in the Hanna Basin of Wyoming. There is a lot of interest in climate change these days, especially global warming. Especially if that global warming can be blamed on increasing amounts of carbon dioxide in the atmosphere. The problem is that it’s hard to know if the trend toward warmer temperatures (at least the global average) is due to natural cycles of the Earth or due to increases in atmospheric carbon dioxide because of the burning of fossil fuels by us, or if there is even a relationship between increasing carbon dioxide and warming (maybe increases in both are coincidence, but not not due to some causal relationship). This paper doesn’t make any arguments to support or refute any ideas about modern global warming. However, it is relevant because it explores a past episode of rapid global warming. This ancient event took place about 55 million years ago. Global average temperatures might have increased by as much as 10 degrees, and did so relatively rapidly (over about 10,000 years). It is suspected that this rapid warming was due to the release of massive amounts of carbon dioxide into the atmosphere. So the warming of 55 million years ago seems similar to modern warming in being rapid (though not as rapid as in the modern scenario) and being potentially blamed on increased carbon dioxide in the atmosphere. In this paper, we assume that the warming at 55 million years ago did happen, lasted about 150 thousand years, then things cooled back down to more-or-less where they had been before. For the sake of this paper, it doesn’t matter what caused the warming, only that it was. This warming event began at the boundary between two epochs on the geologic time scale: the Paleocene and the Eocene. We call this event the Paleocene-Eocene Thermal Maximum, or the PETM. The Paleocene-Eocene boundary is actually defined based upon the onset of warming, as identified by a big change in the relative amounts of two isotopes of carbon (13-C and 12-C) in the atmosphere, and consequently in all organic material that was deposited at that time. How we measure these amounts and what the actual numbers mean are the topic of another paper or blog post. What’s important is that these relative amounts, or isotopic ratios, are presented in what we call the ‘delta notation’ (like δ13C, δ15N, and δ18O) in units of permil (‰). When delta values are more negative, there’s relatively more 12-C in a sample; when delta values are more positive; there’s more 13-C in a sample. The PETM, then, is recognized by a negative carbon isotope excursion (CIE), where the delta values suddenly drop by three to five permil. The PETM ends when carbon delta values go back to what they had been before the CIE started. Much of what’s known about the climate change at the PETM, and the Earth’s subsequent recovery, is known from cores of rock and sediment collected from the ocean floors. Naturally, we’re interested in what would happen to us – those of us stuck on land. In the Hanna Basin, in south-central Wyoming, there is a sequence of rocks that began to be deposited before the PETM started, and continued to be deposited during the PETM and after the PETM. These rocks were deposited on land and are sediments from lakes and floodplains. In these lakes and small rivers were living lots of organisms, in particular, mussels. There was also a lot of organic material being deposited – so much so that now it is represented by many thick coal seams that are actively mined. 1) after the warming ended, did the environment go back to its original state or was it forever changed? 2) what effect did climate change have on the organisms that lived through it? First, let’s look at the rocks. The Hanna Formation, the rock unit I’m studying, is about three kilometers thick (or about two miles). The part we care about is in the top half. The bulk of the Hanna Formation is composed of sediments deposited on floodplains, with little shallow streams that wound around (called fluvial). There are two parts of the Hanna Formation that have lake beds in them (called lacustrine), cleverly called the upper and lower lacustrine units (ULU and LLU). The focus of this study is on the upper and lower lacustrine units and some fluvial rocks in between them. I had reason to suspect, when I started this study that the Paleocene-Eocene boundary lies between the lacustrine units. This is borne out in this paper. It turns out that is wasn’t very easy to identify the CIE (and therefore the Paleocene-Eocene boundary) in the Hanna Formation. The delta values from the coals and other organic materials jump around a lot, probably because the organic carbon I was looking at comes from lots of different types of plants, all of which are slightly different isotopically. One conclusion of this study is that we need to do more ‘compound-specific’ work. That is to say, if we can isolate specific organic molecules and analyze them separately from everything else, that should make the carbon isotope values less variable. Unfortunately, the type of instrument and laboratory that’s needed to do that isn’t present here at the University of Rochester. I’m working on it. Nevertheless, in general where the values are more negative than -26‰, you’re in the CIE. To help make it more clear, I used a three-point running average of the raw carbon isotope data. This tends to smooth out the line, while keeping the big jumps visible. The first major jump into more negative values occurs at about 2500 meters, which coincides with estimations made using mammal fossils and fossil mollusks by others who have worked in the Hanna Formation before. When I compared this overall pattern with other published patterns of carbon isotope variability (some from ocean cores and some from terrestrial sections), things matched up pretty nicely. Using pattern matching, I placed the top of the CIE (and the end of the PETM) at about 2650 meters, which is in the lower part of the upper lacustrine unit. This means that the 150 thousand years of the PETM are represented by about 150 meters of rock in the Hanna Formation, or that a meter of rock was laid down every 100 thousand years. This is actually reasonable – no one in the geological sciences is bothered by this rate of deposition. 1) Looking at isotopes of nitrogen – which gives us information about the organisms from which the organic matter is coming (e.g. we can distinguish between a stagnant pond or a lively lake). 2) Looking at isotopes of carbon and oxygen in the mussels that have been collected – which can give us information about annual changes in the environment that the mussels lived in. Most of the organic molecules that go into coal also have nitrogen in them, though not as much nitrogen as carbon. Usually, when looking at fossil organic carbon, the amount of carbon is so low that there essentially is no measurable nitrogen in the samples. In the case of the Hanna Formation, though, we have coal, which is basically ALL organic carbon-bearing molecules. That means that there’s some hope of finding measurable nitrogen, and that’s what I did. So really, this part of the study was basically done for giggles – just to see if I could do it. And once I had data, well, I had to interpret it. There are two ways to think about nitrogen. One is to simply compare how much nitrogen there is relative to carbon (C/N ratios). A second is to look at the ratios of two isotopes of nitrogen, 14-N and 15-N. C/N ratios give us information about the origin of the organic molecules (from algae or land plants, for example) and the isotopic ratios tell us about status of lake, whether it be full of actively photosynthesizing plants or if it is stagnant. Using the combination of C/N ratios and nitrogen isotopes, it seems that for the most part the organic carbon in the lakes of the Hanna Formation is dominated by land plants. So these are leaves and litter that were washed into the lakes. One interesting isotopic data point sits at the bottom of the CIE. From this point, it seems that there was might have been drying of the lake at the beginning of the PETM. That would make sense, assuming that warming could cause greater evaporation. The work with the mussels is actually been the topic of two undergraduate senior theses that I’ve advised. They’ve been doing some great work to look at the annual changes in isotopes by collecting multiple samples from single shells, following growth lines, to put together a picture of environmental changes that happened during the individual animals’ lives. I don’t say much about that work in this paper. That’ll be published later. What I do talk about is trends. I’ve taken the averages from individual shells and used those to look at how the isotopes of carbon and oxygen from the shells change over time. I also talk about how carbon and oxygen isotopes change relative to each other within a single shell. So, how are carbon and oxygen in the shells of mussels, you ask? Mollusk shells are made of calcium carbonate (CaCO3) which contains one carbon and three oxygen atoms. We collect powdered bits of the shells by using a dental drill and take this powder and put it into the mass spectrometer. The calcium carbonate is converted to carbon dioxide (which is easily measured by the mass spectrometer) by reacting the powders with acid. You put acid on the calcium carbonate, it fizzes, making carbon dioxide, which is drawn into the mass spectrometer and – wango! – we have carbon and oxygen data. Carbon in mussel shells is thought to be derived mostly from carbon dioxide that has been dissolved in the water, and so should track the isotopic value of atmospheric carbon dioxide. Atmospheric carbon dioxide, as mentioned earlier, gets more negative during the CIE then returns to the pre-CIE values. The average values from the shells seem to follow this trend, so there’s no surprises. But now we’re talking about yet another isotope: Oxygen. The isotopes that we measure are 16-O and 18-O. Isotopes of oxygen are a big topic of discussion when dealing with climate change. That’s because oxygen is an important component of water, and water is an important component of climates. For example, climates can be described as arid or humid. There can be rainy seasons or monsoons. Precipitation can take the form of rain or snow. All of these processes affect the isotopes of oxygen in water. Temperature also affect oxygen isotopes. Unfortunately, isotopes of oxygen in water are a very complex system, and would best be discussed in a separate blog post. What is important is that there isn’t any obvious trend in the average values of oxygen from the shells over time, either. Since oxygen is affected by climate, one would expect that there should be some change if there’s been a significant climate change. However, because oxygen is so complicated, the changes in oxygen isotopes by changing one part of climate (the time of year when it rains, for example), might be offset by other changes (like a change in average temperature). The fact that there isn’t any obvious trend or change in oxygen isotopes over time doesn’t mean that there wasn’t any change in climate. And we do see a difference when we compare the variations in carbon and oxygen within a single shell. Carbon and oxygen in shells from the lower lacustrine unit (before the PETM) tend to change in opposite directions (or are negatively correlated). When oxygen isotopic values get more positive, carbon isotopic values get more negative. Shells in the upper lacustrine unit show the opposite pattern. Carbon and oxygen values change in the same direction (are positively correlated), so when oxygen gets more positive, so does carbon. From this, it’s possible to infer that before the PETM there was a lot of vegetation and photosynthesis going on around the lakes, whereas during the PETM, photosynthesis might have slowed down during the warmer months and bacteria might have dominated life in the water. This seems reasonable since in the upper lacustrine unit there are also huge fossilized bacterial mats called stromatolites. So that’s what this paper is about. We see some evidence of environmental change due to warming at the Paleocene-Eocene boundary. Particularly, we have the one really positive nitrogen isotopic value near the base of the CIE and we see a change in the relationships between carbon and oxygen isotopes in individual mussel shells during the PETM as compared to pre-PETM. One thing that hopefully is obvious however: there is more work to be done. The work with nitrogen isotopes started with a shot in the dark. More samples should be analyzed. There’s definitely more work to be done there. My students’ work on the mussel shells will greatly contribute to this as well. Since I wrote this paper, there have been more shells collected and more samples analyzed. That work needs to be wrapped up and published soon. We really need to do that ‘compound-specific’ work I mentioned earlier to help clarify the CIE. It’ll also help clear up what sorts of plants were around at that time, so we can better interpret the nitrogen data. Also, though not discussed at all in the paper, is the fact that there are paleobotanists out there looking at fossil leaves and pollen. There’s a story to be told there, and someone’s getting a Ph.D. For their efforts. I can’t wait until that work is done!